In January 2014, the Pew Research Center (PRC)—a prestigious think tank based in Washington, DC (which provides information on social issues and demographic trends shaping the world)—published Religious Hostilities Reach Six-Year High . In this important report, the worldwide public-opinion surveyors chronicled the steady growth of religious persecution around the world and found that social hostilities involving religion are currently most frequently directed against people of Christian faith. The sharpest increase was in the Middle East, which, the reporters surmise, is the result of the 2010–11 political uprisings known as the Arab Spring. That region’s score on the Social Hostilities Index rose from 5.4 in 2011 to 6.4 in 2012, three times the global median. A January 8, 2014 Breitbart News feature with the headline “A Report from the Non-denominational Group Open Doors Says the Number of Christians Martyred Around the World for Their Faith Nearly Doubled in 2013” separately confirmed the discoveries of the PRC report. Besides the Middle East, the Pew findings also detail an escalation in the United States from the lowest category of government restrictions on Christian expressions as of mid–2009 to an advanced category in only three years, where it appears poised to continue upward at the time of this article. If recent activity is any indication, it may not be long before “one nation under God” joins those red-listed countries where Bible-based believers find themselves under the most severe discrimination. While Ibrahim’s assertion mostly reflects American involvement in foreign conflicts, examples of repression in the U.S. against people of Christian faith are growing and are easily obtained online. But what such examples fail to mention is the developing emergence on the world scene of what will become one of the greatest threats ever raised against the authentic (born-again) body of Christ—Religious Christians. For some students of prophecy, the facts outlined here were not only predictable, but were a prophesied prelude to a period in history wherein true believers will be “beheaded for the witness of Jesus, and for the word of God, and [for] not worship[ing] the beast, neither his image, neither [receiving] his mark upon their foreheads, or in their hands” (Rev 20:4). Yet when discussing this end-times scenario, and in particular the subject of rigorous persecution, often overlooked is the role that religious “Christians” are being shaped today to play against the true body of Christ. The very idea could seem beyond credulity if it were not for what the inspired texts themselves convey. Then shall they deliver you up to be afflicted, and shall kill you: and ye shall be hated of all [groups of people] for my name’s sake. And then shall many be offended, and shall betray one another, and shall hate one another. And many false prophets shall rise, and shall deceive many. And because iniquity shall abound, the love of many shall wax cold. Elsewhere in the Bible this coming era of Great Tribulation is described as when the Antichrist will have power “to make war with the saints, and to overcome them” (Rev 13:7; Dan 7:21). Immediately following those verses, there is description of a second beast with “two horns like a lamb” who speaks “as a dragon” (Rev 13:11). Most evangelical scholars identify this second “beast” as the leader of the end-times religious institution who will be under Satan’s control. The phrase “like a lamb” indicates he will pretend to represent the Lamb of God and the Christian church, while the expression “speaks as a dragon” identifies the devilish source of his authority and power. This final global super-church leader will be a murderer not unlike the Antichrist, and will cause “that as many as would not worship the image of the beast should be killed” (Rev 13:15). Thus the book of Revelation outlines how the political figure of the Antichrist derives ultranational dominance from the world’s religious faithful through the influence of an ecclesiastical leader (also called the False Prophet) who will not hesitate to swim in the blood of the genuine saints of God. In the days between now and when these men of sin are identified, this reality—that latter-day churchgoers will soon believe they are serving the kingdom of God by participating in or approving the death of conservative Christians—is not a concept lost on all contemporary churchmen. There are those who see things taking shape even now for a war that will eventually pit religious “Christians” against the real members of the body of Christ. For example, the Archbishop of Canterbury, Justin Welby, stated early in 2014 that “modern Christians” will now be “called to suffer and even die for the faith” in a new era “of martyrdom.” But a clarifying document that was not supposed to be made public and which was authored by a senior advisor to Welby’s predecessor details how such a time of great persecution is coming because true believers will, according to the letter, be driven underground by liberal Christians and will become a dissident association comparable to resistance movements during World War II. Not long ago, Dr. Chuck Missler made me aware that Dr. J. Vernon McGee, one of America’s most beloved Bible teachers of the past century, taught the same and clarified that these true Biblical believers would ultimately be driven “underground” by none other than latter-day denominational churches. Let me go out on a limb a little bit and prophesy. I see the time coming when all the holy men whose eyes have been opened by the Holy Spirit will desert worldly Evangelicalism, one by one. The house [institutional Christianity] will be left desolate and there will not be a man of God, a man in whom the Holy Spirit dwells, left among them. 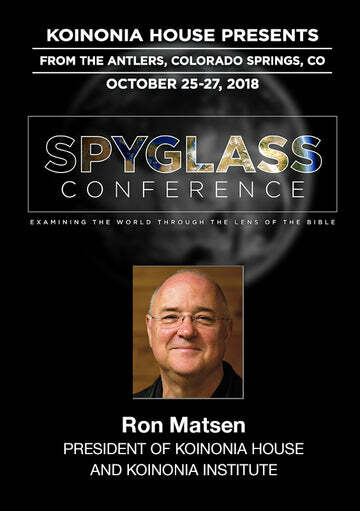 These Holy-Spirit-devoid church attenders will join other “religious types” to constitute the Antichrist’s apostate religious and political order (connected to “Mystery Babylon” in Revelation, chapter 17) and, as unfathomable as it may sound, will seek to formulate perhaps the most egregious rank among the Man of Sin’s Gestapo members in their appetite for destroying latter-day, truly born-again believers. Impossible, some might say? Tell that to the trainloads of Jews who vanished beneath the brutality of Nazi Germany members who maintained their Protestant faith or the hundreds of thousands of men, women, and children who have died since the days of Christ’s crucifixion and the martyrdom of His disciples at the hands of institutional church authorities and holy temple leaders. The European wars of religion (16th and 17th centuries) are further examples of such mayhem by very religious people, as could also be considered the Muslim conquests (7th to 19th centuries), the Crusades (11th to 13th centuries), the Spanish Reconquista (8th to 15th centuries), the Ottoman wars in Europe (15th to 19th centuries) and the Inquisition of the Roman Catholic Church (12th to 14th centuries). But now, what was old is new again, and as a militant spirit of evil pushes through the veil toward a final supernatural conflict (in which blood will flow to the horses’ bridle), violent clashes over matters of faith are once more boiling around the globe. Consequently, brutality wrought by the final Antichrist and his end-time religious assassins will soon make the combined depravities of those wars mentioned above look like child’s play. When he raises his fist, “speaking great things… in blasphemy against God, to blaspheme his name, and his tabernacle, and them that dwell in heaven” (Rev 13:5–6), at his right hand will stand those house-of-worship attendees who are vividly described in the final book of the Bible as “drunken with the blood of the saints, and with the blood of the martyrs of Jesus” (Rev 17:6) as they dance and sing in their mega-church “habitation of devils and hold of every foul spirit” (Rev 18:2). Nonetheless, A Light at the End of the Tunnel? In a chapter for the new book Blood on the Altar: The Coming War Between Christians vs. Christians , Dr. Chuck Missler outlines how something very good can, is, and will come out of the lead-up to that period in history mentioned above, when true believers will be thoroughly persecuted. Missler describes how so many real believers today have already started their exodus from institutional Christianity and are reemerging in home groups, just as the church began in the book of Acts. There is presently a groundswell across America—as in many other parts of the world—in which people are meeting in small groups in homes during the week, rediscovering the Bible, and enjoying a more intimate fellowship than they find in “Sunday church.” Many of these are encouraged and supported by their formal church associations; others simply meet independently. This is especially true of many young people, to whom “Sunday church” is a spectator sport, and who seek more personal participation and accountability. After all, this is the way it all began: twelve guys along the seashore with their Teacher. All the remarkable episodes of the early church in the book of Acts occurred in homes. It wasn’t until the fourth century that edifices began to be erected, when Christians exchanged the rags of the caves for the silks of the court. And committed ambassadors were replaced with hirelings, inserted between an attendee and the Word itself. In more than sixty years as a practicing Christian, the place that I’ve always seen people really grow spiritually is within small group Bible studies: where they can ask questions and hold each other accountable. (Note: If you are interested in starting a home study group or would like more information on how the Koinonia Institute can provide resources, please visit koinoniainstitute.org and also see Dan Stolebarger’s article in this month’s issue). This recognition of vibrant Christianity growing outside the walls of Western religious centers offers hope that the true body of Christ always has and will survive and even triumph during times of persecution. This includes the coming war between Christian vs. Christian.